Broom cypress fruit (Difuzi)-Kochia scoparia (L.) Schrad. Botanical Name: Kochia scoparia (L.) Schrad. Common Name: Kochia fruit, Broom cypress fruit. Part Used & Method for Pharmaceutical Preparations: When the fruit ripens in autumn, it is gathered and dried in the sun. Functions: 1. To clear heat and transform dampness; 2. To stop itching. 1. Damp-heat in the urinary bladder manifested as dysuria, painful urination, frequent urination and urgency of micturition. 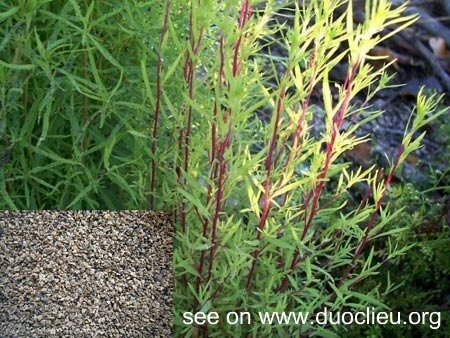 Broom cypress fruit (Difuzi) is used with herbs that clear heat and promote urination, including Talc (Huashi) and Plantain seed (Cheqianzi). 2. Eczema and scabies. Broom cypress fruit (Difuzi) is used with Phellodendron bark (Huangbai), Flavescent sophora root (Kushen) and Dittany bark (Baixianpi).